Blurb: As dawn approaches in New York, literary agent Isabel Reed is turning the final pages of a mysterious, anonymous manuscript, racing through the explosive revelations about powerful people, as well as long-hidden secrets about her own past. In Copenhagen, veteran CIA operative Hayden Gray, determined that this sweeping story be buried, is suddenly staring down the barrel of an unexpected gun. 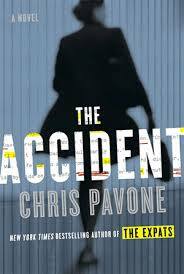 And in Zurich, the author himself is hiding in a shadowy expat life, trying to atone for a lifetime’s worth of lies and betrayals with publication of The Accident, while always looking over his shoulder. Review: I received a copy of this book for free through NetGalley, all opinions expressed below are my own. I originally put in a request for a print galley through an ad in Shelf Awareness. I didn’t get a print galley, but was sent an email inviting me to have access to an e-galley. I gladly clicked through the link and then let the book sit on my Nook for a while. Well, for months, really. Can I just tell you right now that that was the dumbest thing I could have done?! This book was awesome. It sucked me in from the first page (I was stupid and started it while on the treadmill and only had about 20 minutes to read before my bootcamp class started). I was tempted to skip that class just so I could continue to read! It definitely has an immediate draw, that’s for sure! This book has every twist and turn imaginable. Just when you think you’ve got it all figured out, another curveball is thrown and you’re left with your mouth hanging wide open and your eyes bugging out of your head in utter surprise! At least I was! If I had to nitpick one thing about this book, it was the sheer number of characters and storylines that were introduced in the beginning. I had a little bit of trouble trying to keep track of what was what and who was who. But once things started to come together, I understood why everything was placed as it was. It definitely allowed for layers to be peeled back, one by one. I found this book to be really enjoyable. I had figured out who the “author” was relatively early on, but I still had no idea about other revelations at the end of the book. The writing was suspenseful and the characters were well-developed. This was my first time reading this author, but I can say with certainty, it won’t be my last! One last thing to mention, I thoroughly enjoyed seeing a different side of the publishing business through this book. I had no idea how the agent/editor/publisher, purchasing/owning, and then the film options truly worked. So it was pretty interesting to get an insider look on how the process works. Awesome! I remember seeing The Expats when it came out and it’s great that he followed that up with another great book. I’ll have to look for it.